Ever since we went on hiatus we've been thinking of what the best way to bring back the project was, and we decided, after careful thinking, that we didn't need no damn proxies. So, here we are, officially opening our shop in international waters. 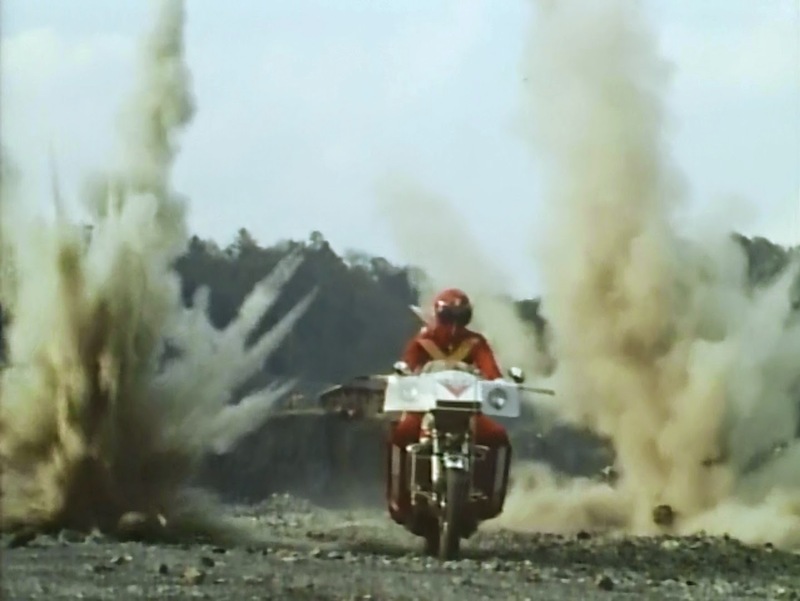 Just a few notes, because you're all probably eager to get to Goranger. After all, that's what you came here for, right? First and foremost, I'd like to clarify that episodes 1 through 32 are the same as we had up before, with just a few minor edits. They will, however, be reworked accordingly when we find the time... I can tell they'll all be ready by the time we finish the series and make a final batch, at least. Secondly, about the new episodes: we are joining with the folks over at Love & Care (which I'm actually a founding member of). Since Angel is helping out a lot on these episodes, it felt only fair that both groups share credit, right? Anyway, with no further ado, grab these while they're hot! And expect more to come soonish, we've been working very hard on this. Episode 34: Goranger storm in this episode is named Blue Tengu. A tengu is a mythological creature from japanese folklore, and a mask commonly used in Kabuki theatre. The blue color is used to oppose the MOTW's red color. Episode 34: The riddle in this episode is based on a silly pun, like quite a bit of the other riddles in this series. Taro asks which is the tea that is drank at night, even if it's morning when you drink it. The answer is bancha because "ban" sounds like the japanese word for evening, and "cha" means, you guessed it, tea. Episode 35: The riddle this time involves even more need of japanese knowledge, so here we go. Seagull is "kamome" in japanese, and turtle is "kame". So, when you take out the middle of the seagull (the "mo" syllabe), you get a turtle. Would you know if there'll be a set schedule to the releases, or will it be a sporadic thing? Oh no, I was just curious. That question wasn't meant to pressure hahaha! But yeah, it seems you guys are super busy with all the projects you have underway, so I totally understand. How would I go about altering the subtitles to use the official spelling of Gorenger in the softsubs? On a related note, how about the scripts? Scripts are available on our Releases page, with a font pack included. About changing the spelling, I'm not sure whether you're asking us to do it or asking how to do it, so... In case you're requesting us to change it I'm sorry, but that'll stay as it is on our future releases. In case you're wondering whether you can do it, feel free to. All you have to do is open the scripts on Notepad, or AegiSub, and edit them to your liking. Thanks for the swift reply! Am in the process of altering now! Okay, I've run into a snag. For some odd reason, the karaoke lines on every episode past 01, when I attempt to change the Romanji for Goranger into Gorenger, refuses to be changed. All other lines (including all lines in Episode 01) can be changed without a hitch. You have to go to "Automation" menu and then select "Apply Karaoke Template" after editing those blue lines. This happens with THIS specific line for every episode EXCEPT for Episode 01. That fixed my issues, Clockup! Is the translation of Gold-mask`s name that was used in episode 1 at 3:04 a typo?